In his book “In the Memory House,” author Howard Mansfield raises questions about who we, as a society, choose to remember and why. The “why” has less to do with the accomplishments of those being remembered and more to do with our sense of who we are as a society. Some people’s stories get told; others’ stories do not. Who decides? In 1993, when he wrote the book, he made an observaation that describes what we are witnessing today: “History is like that; you’re gone but a hundred, a hundred and fifty years, and someone takes you off your pedestal, or they leave your name off of your portrait.” After last week’s events in Charlottesville, statues, monuments, and markers honoring the military leaders of the Confederacy are coming down but with tens of thousands of books written about the Civil War, those men are not likely to be forgotten. The monuments and markers in Minneapolis Pioneers and Soldiers Cemetery are mostly in memory of individuals and none of them would be viewed as offensive or hurtful. There is a flagpole that was a gift of the Women’s Auxiliary in the 1930s, two Depression-era stone birdbaths, and a large boulder with a sentimental quote by Abraham Lincoln that celebrates the contributions of pioneer women. There is a large block of granite with a plaque dedicating it “To Our Nation’s Defenders.” Where it came from, and when, is one of our enduring mysteries. The marble marker for territorial pioneer Philander and Mary Prescott was encased in stone in the 1940s. Around the same time a similar, though smaller monument was erected to honor Charles Christmas, Hennepin County’s first surveyor. There is a memorial monument to Annie Holl, who was instrumental in preserving the cemetery in the mid-to-late 1920s. Few people today recognize the names of Philander Prescott, Charles Christmas, or Annie Holl but at one time those names were fairly well known. “Gone, But Not Forgotten” is a common inscription on headstones but those words are often more of a wish than a reality. Those who knew the person buried under those markers die or move away and after a few generations only those with genealogically-minded descendants are remembered. Markers are obliterated by weather, time, and vandalism. Many of us have photographs of unidentified people who may or may not have been relatives. No one seems to have imagined the possibility that at some point there wouldn’t be anyone left to tell us who those people were. One of our on-going projects is to replace broken and illegible markers for all of our known veterans. We want to make sure that those men who are gone are not forgotten. In the past month we have replaced thirteen Civil War era markers. They are all located in Blocks A and B in the southeast quadrant of the cemetery, and they are beautiful. The markers are white marble with light black or gray veining and have the soldiers’ names and military units carved inside of a shield. There are also a number of veterans, perhaps dozens, who have never had military markers. Tim McCall, the cemetery’s archivist, has discovered a number of men who served but who had not previously been identified as soldiers and so have no markers. Others who were known to be veterans don’t have markers because, according to cemetery records, their “military unit [was] unknown.” Correct confirmation of military unit in which particular soldiers served is now available on the internet. At this point we’re not exactly sure how many new markers need to be placed but it’s safe to estimate that it is somewhere between 50 and 100. We’re already at work on putting together a list of markers to order for 2017-2018; it will include some replacements but also some markers for soldiers who never have had them including three recently discovered African-American Civil War veterans. There were many people involved in making this happen. The Daughters of Union Veterans made a generous donation to cover the cost of setting the markers. Brian Orth provided the equipment and expertise. 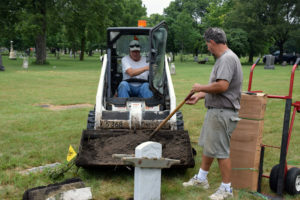 Mike Barth, the cemetery’s caretaker, and some of his colleagues from the Minneapolis Street Department provided invaluable help. Tim McCall helped identify those whose markers were in need of replacing and documented the installation of the new markers. About 30 years ago, the then caretaker of the cemetery, told me that there was at least one Confederate veteran buried in the cemetery, and maybe as many as 3. I hope that these men too, are remembered with a marker. After all, in 1956, a law was passed that recognized Confederate veterans as US veterans, and the VA will also issue headstones for them, slightly pointed rather than the rounded stones for Union veterans.